Being a nurse is one of the toughest jobs out there. It’s a profession that most people underestimate because some foolishly think nurses aren’t as capable as doctors. Still, the four Pinay nurses we spoke to revealed that despite the stereotypes, low pay, and long hours, they wouldn’t turn their backs on this profession. Do you worry about money? Not at all. P300,000 to P400,000, including my OJT. I have a separate savings account. It provides me a sense of security. I know my hard-earned money is safe. Do you live alone? I live with housemates. I pay for my part of the rent and electricity, and I buy my own groceries. I spend around P35,000 a month to cover all of that. No, not really. I’m pretty good at putting aside enough without depriving myself. I’m trying to minimize my monthly expenses, but we’ll see how that goes. No. Being a nurse requires so much time and energy. I always have overtime and some days, I’m also on call. I barely get six hours of continuous sleep because we’re terribly understaffed. What’s the dynamic like between doctors and nurses where you work? The dynamic is very much like the one of a typical boss and secretary. Our doctors tend to boss us around. They sometimes forget that we are an integral part of patient care. What’s the best part of being a nurse? It gives me a sense of fulfillment, a sense of worth—especially during those particularly draining shifts. Everyday is a challenge. Plus, I feel like I’m constantly learning from all the people I meet and work with. Where there is knowledge gained, there is also the ridiculous amount of stress that comes with it. We focus on our patients, and we sometimes neglect our own well-being. I can’t tell you how many meals I’ve skipped because of work. We need to increase the nurse-to-patient ratio. It’s a crucial part of ensuring the safety of both nurses and patients. What’s one myth about nurses that you’d like to debunk? What we do isn’t just about routine tasks. We have A LOT of responsibilities, and we’re also required to make decisions during stressful situations. Have you considered looking for work abroad? If so, where and why? I studied and worked in Pangasinan before I applied for jobs in Singapore. I’ve been here for a couple of years now, and it’s been hard but worth it. If you could go back in time, would you still pick this line of work? Why or why not? Yes. I can see the impact I’m making on someone’s life, and I’m proud to have such a rewarding job. Up next: Becka, 31. Monthly income range: P13,000 to P15,000. How long have you been working? Nine years and nine months! Do you worry about money? Now that I’m married, yes, I do. I paid around P20,000 per semester. Live within your means! It may be difficult, but any amount of savings is better than nothing. My salary covers the electricity and the groceries. Yes, lalo na ‘pag may uso at bago. My income is really small right now, but I really want to have my own business some day. No, I’m not. As a nurse, everyone expects us to know everything. Everyone also expects us to do waaay more than our job description, and where I’m working, there’s no OT pay. Nurse-to-patient ratio is also ridiculous right now. One nurse for 20 patients? Does that sound right to you? Maayos nman. We know our roles. We’re professionals. Some of us are even friends. The best part is when my patient is discharged, when I see how much they’ve recovered. When they thank me, it feels like a million bucks. SOME patients complain too much. They treat us like they’re the ones giving us our salaries. Nurse-to-patient ratio. And the fact that we aren’t paid enough. I want people to know that doctors aren’t the boss of us. Hindi lang kami sunod nang sunod. We’re independent. We contribute to the process. Yes! I’ve looked for jobs in Saudi or Doha, but now I’m also considering Canada. Yes. It’s my calling. I love serving people. Up next: Aine, 29. Monthly income range: P20,000 to P25,000. Not so much. I worry more about how I can maximize what I earn rather than how much I earn. A lot! I used to pay P40,000 to P50,000 per semester. It got even more expensive when I did my clinical job in Davao City since I had to pay for accommodations, food, and travel every week. Right now, I’m taking my MA in Nursing at UP Open University, which is around P6,000 to P8,000 per semester. I list all my expenses, so that I can track where my money is going. I wish I did this sooner. Do you live alone? No, I still live with my parents. I pay for electricity, which is around P3,000 to P4,000 a month. I have other expenses as well though: P3,000 for life insurance, P2,000 for my phone bill, P2,000 for donations, P4,000 for my emergency fund, and P3,000 for food and transportation. Kind of. People think I earn a lot because I work for the government. It adds pressure. I want to be financially stable before I turn 35. Given that my salary is just enough for me, I want to start financially preparing myself for a famiy. I believe so. Considering the workload, I’m pretty fortunate with the compensation I get. Having a fixed schedule and not having to worry about shifting is already an added bonus. Working in a school gives me the opportunity to practice autonomy in my profession, even though I’m still under the guidance of a physician. My set-up is quite different from hospital nurses because I am more focused on implementing health promotion and disease prevention strategies. The best part of being a nurse is having an impact on my patients’ lifestyles—not just physically, too. It’s all about holistic health. I really don’t like when people believe everything they read online and second guess our decisions. I hope the government finds a way to alleviate health care demands so nurses aren’t overworked and underpaid. 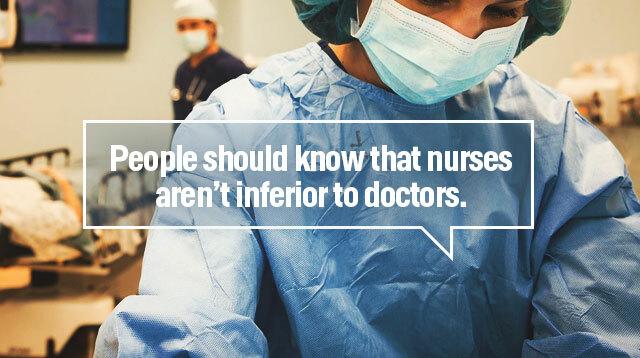 I want people to know that nurses aren’t inferior to doctors. Doctors and nurses are partners in health care, which does not mean that one is superior over the other. At times, we also have the right and responsibility to argue with the doctor over questionable orders since we are in closer contact with the patients. Yes. Always. My family wants to migrate to Canada. To be honest, this wasn’t my choice. But after years of being a nurse, I’ve become more patient and compassionate. I’ve developed a deeper sense of empathy. This vocation has molded me into the person I want to be. Up next: Jaynelle, 25. Monthly income range: P10,000 to P12,000. How long have you been working? A little over two years. How much did your education cost? P60,000 to P80,000 per semester. What’s your #1 saving tip? I use this formula: Income – Savings = Expenses. Do you live alone? No, I stay with my parents. I pay for our cable and internet bills. No. I know my priorities. I know what I can spend on and what I should save. I want to be financially stable. I also want to be able to afford my own house and the luxury of traveling the world. No. Nurses here are SO underpaid. Ideally, the dynamic should be collaborative, but honestly, nurses are treated poorly here. It's like nurses work under the provisions of the doctors. The best part of being a nurse is definitely being able to touch the lives of your patients in the most caring way. The worst part is having to see your patients suffer. I think nurses deserve to be paid more. Most people think we just follow doctors’ orders. That is not true. We have our own mind, and we speak up when we disagree. Yes, I’ve considered it. I’ve been looking for jobs in Australia and the UK. I think I’d have more of a professional growth outside the Philippines. Of course. Despite all of the negative things about my job as a nurse, I’m very proud to be one.